It is a cold winter’s night in early December and there are thousands of celebrants lined up on Market Street in Rhinebeck. In the distance there is a rumble, the sound of a parade advancing. Spectators, jockeying for position, make sure that any children in the crowd are out in front where they can see. A white haired man, on a white puppet horse, is coming down the hill leading the parade. He is clad in flowing red robes and accompanied by children wearing crowns and carrying branches. The adults with them are carrying stars on poles. It is a slow procession, as the man on his steed takes the time to engage every child who stares in wonder, while he zig-zags down the street. Sinterklaas has come to town. This celebration of the season is held in the present, yet harkens back to a past when New York was a Dutch colony. Its inhabitants reveled in the holiday honoring St. Nicholas, the Patron Saint of Children. The Saint was beloved, but judgmental; he rewarded the good children and punished the bad. Sinterklaas was transplanted to New York by the Dutch and commemorated by Irving. But his personification was really not quite yet settled. Was Saint Nicholas the stern bearded bishop with mitre and scepter, or could he assume a different personality? Irving hinted at his persona as a more spritely, stout and merry man who smoked a pipe. This version of Saint Nicholas was later codified in that great Christmas chestnut T’was the Night Before Christmas. Recited over and over and reprinted over and over again, it shortly became popularized that the once stern bishop was actually a jolly old elf, with a belly that shook like a bowl full of jelly when he laughed. With his sleigh pulled by tiny reindeer who waited patiently on the roof, Saint Nicholas slid down the chimney with a sack of goodies. After the stockings were filled, and with a pipe clenched in his teeth, he placed a finger aside his nose and magically rose up the chimney. It is said that Mrs. Thomas Nast would often read to her husband, an illustrator for Harper’s weekly, as he worked on drawings. Inspired by one such recital of the Clement Moore poem, Nast drew his first Sinter, now Santa Claus, in 1863. The figure gradually refined over the years to morph into the Santa Claus that we now know. Albert Bigelow Paine, in his biography Thomas Nast: His Period And his Pictures, begins his book with a personal recollection of how as a young boy in Iowa he studied with intense interest the images of Santa Claus in Nast’s 1866 double page Christmas cartoon. The four page description of Paine’s experience of wonderment is later recalled when he met Nast and then considered writing his biography. Because the artist was perhaps better known for his patriotic and satirical cartoons Paine hesitated to include discussion of his Christmas pictures. But Paine recalled his boyhood and recognized the resonance. The politicians lambasted in Nast’s drawings would fade away but Santa Claus would remain. The feasting and fellowship that was further advanced by Charles Dickens became, by the end of that century, a commercial promotion, conspicuous consumption of gifts, especially toys for children. For it was in Nast’s time, in the period of Victoria, that childhood became a protected state of play and exploration. No longer considered tiny adults, children were allowed to go to school and play in nurseries with the toys they received as rewards for their good behavior. Coal in the stocking was reserved for the naughty, a fate my Uncle Jim suffered sometime in the 1920’s. As a child I remember a Christmas where my siblings and I were greeted by Santa Claus. He was standing in our row house in the Bronx arranging gifts under the tree. It would be several years before we would know that our visitor was actually our Uncle Cliff who, at 5 foot 4 and 160 pounds with twinkling blue eyes, was perfectly cast for the role right down to his ho, ho, ho’s. He left by the front door and crossed the street on a skein of snow that had fallen overnight, and then we tore into our presents. We were good children and, for the most part, our wish lists were fulfilled. Fast-forward to a meeting held in the Town Hall in Rhinebeck, New York in 1984 where a woman was tasked with creating an event to replace a craft show which had moved away from the village. Jeanne Fleming gathered up the suggestions from the brain-storming session held that night. She decided there was a need to return to a now distant past by creating an Old Dutch Christmas that included a return of Sinterklaas. She saw a need not only to create an event which draws crowds to the village but to correct the focus of their celebration. Children would take the center stage, not to be judged by the stern Dutch Bishop, but be embraced by his love and generosity. They would wear a crown as little Kings and Queens and carry branches which, in turn, carried wishes not for themselves, but for others. Their celebration would be about fellowship and giving, service to others, and not receiving. 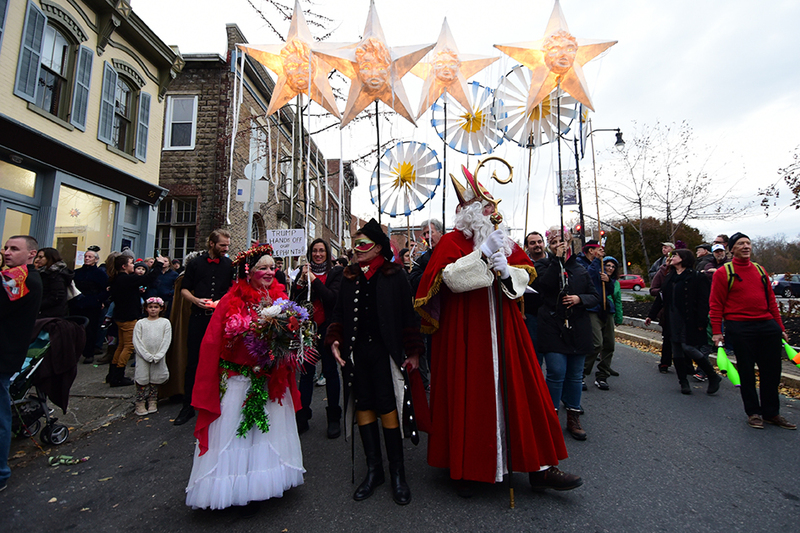 The celebration has returned after a 10-year hiatus is now known as Sinterklaas: An Old Dutch Tradition in Rhinebeck. In the weeks leading up to the day (December 1, 2018) workshops take place for children to make their crown and decorate the branches. Adults are given stars, a universal symbol that avoids any specific religious connotations, as Fleming wanted to create an event that also celebrates diversity. This promotes the universal appeal to the community and a fellowship which eliminates any denominational divides. 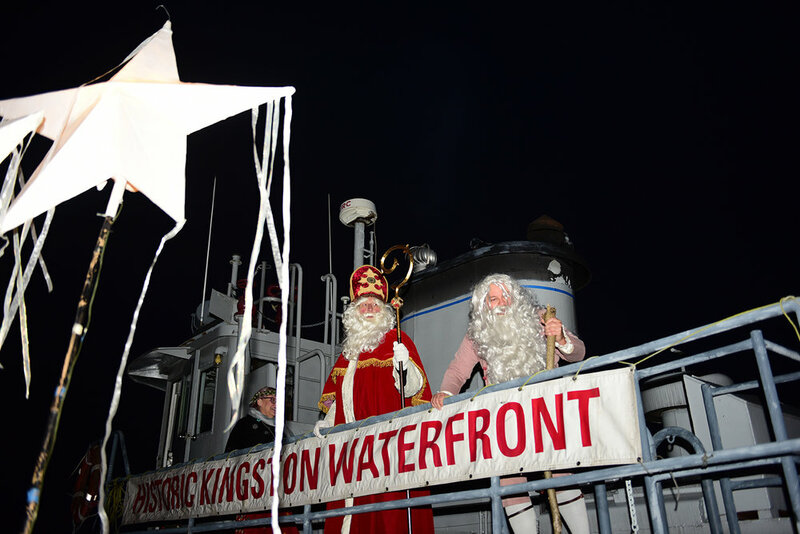 The celebration starts on the Rondout in Kingston where a parade takes Sinterklaas to a tugboat where he makes his way across the Hudson to Rhinecliff. A procession then forms with 400 volunteers, some of whom control the puppets, a number of which are as old as the celebration itself. The puppets are refurbished and made now by Alex Kahn and Sophia Michahelles who first became enchanted by them when they were parade spectators so many years ago. Under the guidance of Jeanne Fleming they became the puppet masters of the celebration. In addition to the puppets there are the Grampuses, who evolved from grumpy members of the town council, dressed in the manner of impish medieval wild men. They dance a la Saint Vitus and play tricks on the children in a slightly mischievous manner. The slow procession ends in the center of town with a ceremony. The adults bow down with their stars to the children, and then raise them up, to create a canopy where the children and Sinterklaas are duly honored. When speaking about the celebration that she created Jeanne Fleming’s voice is full of enthusiasm and pride. She points out that when the parade is taking place and Sinterklaas is making his way down the street the crowd is fully engaged The participants and spectators are in the moment, a moment of joy for the season of fellowship, giving and service.